Another photograph taken in Port Renfrew two years ago. It was cold on that trip. The puddles were frozen. To see other Port Renfrew photos, click here. Probably on your iPad in which case it can be blamed on that things horrid auto spell checker. I had to turn mine off. Quite right too. I leave mine tethered while at home, I don’t want it getting up to no good, even though it is only a Mini 2, it has a propensity for jerking my chain. 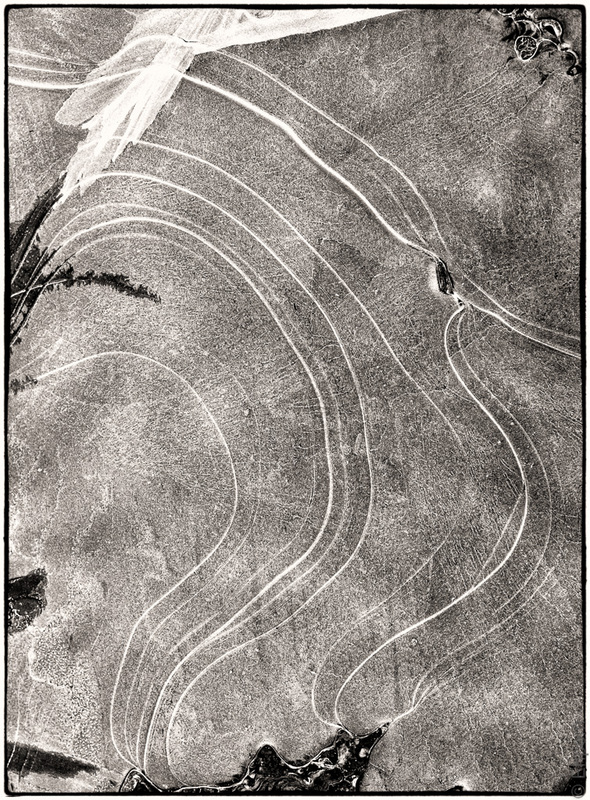 Hi Mr E. This photo reminds the Nazca lines in Peru. It is strange to think of a desert when looking at a photo of ice. That is strange! I think it has a bit of the aerial landscape effect that sometimes happens with photos that have uncertain scales. Remarkably like an image I put up (in colour) a few days ago. The same lines through the ice. Frozen puddles make great images. Hi Andy. Melinda pointed me to that post of yours, which I had not yet had a look at. There is a remarkable similarity which must be related in some way to the physics of thin ice forming on shallow water. My shot had very little colour, and I wanted to accentuate the white lines so as to make them more like contours, hence the conversion. There’s a research project there for someone to investigate how these phenomena happen. Hard to get a sense of scale, but perhaps that was the intent. Love the smooth contour lines. Hi John – I do like the lack of obvious scale, and the smooth lines! Both of them make me need to put on a heavy coat! Thanks Melinda – I love that quote that Andy includes with his post. Very apt. I think less of coats and more of grippy shoes when I see ice – there is nothing quite like an explosive loss of traction, arms and legs flying in all directions. Going to an ice fight armed only with a tailbone is sure to hurt.